Is a string of waxed thread really that important when it comes to your dental health? Absolutely. 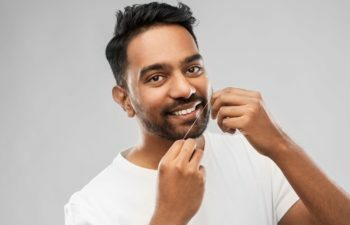 If more patients knew the profound benefits of flossing, there would certainly be a higher percentage of Americans who floss on a daily basis. The latest research shows that only 1 out of every 4 Americans floss as they should. So what is all the hype about flossing? For starters, flossing cleans 35% of your tooth structure that your toothbrush can’t reach. Leaving these areas in between your teeth untouched is an open invitation for plaque and bacteria accumulation. You should know that once plaque accumulates, it will harden into tartar. Once it becomes tartar, only a professional dental cleaning and scaling can remove it effectively. This buildup also puts you at a high risk for cavities and gum disease. Speaking of gums, they need a thorough flossing on a daily basis. Flossing can clean areas just below the gum line and around your tooth root, a sneaky place for bacteria to hang out and cause infection. Not only can infected gums lead to tooth loss, but periodontal disease is also linked to heart disease, stroke, diabetes and other serious health conditions. So if you think your teeth are clean enough to skip the floss, consider the risk you are putting your overall health in when you stop your oral hygiene routine short. Another big (and personal) advantage for flossing is fresh breath. The primary causes for halitosis typically originate from poor dental hygiene. The bacteria that sits on your teeth (or between your teeth) emits a foul odor that will exhaust your breath mint supply if you don’t tend to it. Do yourself and your friends a favor and take the time to thread some floss between your pearly whites. With today’s expansive options in floss, there is really no excuse not to pick up the habit. Patients can choose between waxed floss, unwaxed floss, flavored floss and even electric flossers for those that prefer an easy and minimal effort experience. At Georgia Orthodontics & Children’s Dentistry, we help our patients find the right flossing tool. In the majority of cases, the best type of floss for you is the one that you will actually use!